Last night I went to a beautiful holiday party in my friend's new apartment. Besides serving outstanding homemade cookies with slivered almonds and Ebelskiver (tiny filled pancakes with blueberry preserve), there was also a pot of mulled wine on the stove that filled the whole house with a festive air. 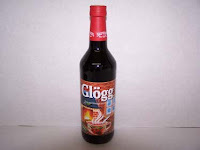 Apparently it was made with a dry red wine, a mix of mulling spices, and this Swedish Glogg syrup. The syrup was what really made the difference (this was honestly the best mulled wine that I've ever had). I've decided that I'll bring along a bottle of this to the next holiday party that I attend and maybe get a few bottles as Christmas gifts as well.